(BOSTON) — As embryonic tissue develops, cells push and pull on each other, and they must do so correctly for the tissue to develop properly. Now scientists at Harvard University have devised the first method to measure these tiny forces in three-dimensional (3D) tissues and living embryos. The method, which involves injecting tiny oil droplets, could lead to new tools to diagnose cancer, hypertension, connective tissue diseases, and more. Scientists from the Wyss Institute for Biologically Inspired Engineering at Harvard University and the Harvard School of Engineering and Applied Sciences (SEAS) reported the work online December 8 in Nature Methods. Biological tissues don’t just sit there inside the body — they are constantly in motion, with cells tugging on and nudging other cells and the extracellular matrix — the molecular scaffold that knits cells together into tissues. As a result, tissues live in a state of dynamic tension, like a partially stretched rubber band. 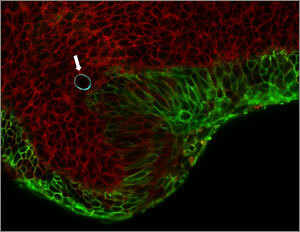 Cells in the embryonic jaw of a mouse (red) squeeze a cell-sized, spherical oil droplet (with blue border, shown with arrow). The droplet deforms like a water balloon, and the degree to which it deforms allows scientists to calculate the pressure cells exert on their neighbors. Credit: Otger Campàs/ Nature Methods. Studies in lab-grown cells suggest that mechanical forces are as important in regulating biological function as chemicals and genes. But scientists had no way of studying those control mechanisms in developing embryos because they had no way of quantifying mechanical forces at specific positions in living tissues. Such forces are particularly important as the body develops from the fertilized egg into tissues and organs with specialized shapes and functions — a process known as morphogenesis. Biologists studying morphogenesis knew that as the embryo develops, mechanical forces direct cells to multiply, steer to their proper locations, and specialize. But they have long focused on detailing the genes and cellular pathways that direct and coordinate this process, rather than the role of cellular forces — simply because they did not have the tools to measure those forces, said Otger Campàs Ph.D., an Assistant Professor of Mechanical Engineering who holds the Mellichamp Chair in Systems Biology at the University of California, Santa Barbara (UCSB). Campàs is a former postdoctoral fellow at the Wyss Institute and SEAS. “Shaping tissues and organs involves an interplay between genetics and physics. If you can’t measure the physical side of it, you can’t completely understand the problem,” Campàs said. Scientists had previously developed several methods to quantitate how cells push and pull on each other while growing in a dish in the lab. But they had no good way to measure these forces while the cells are building 3D tissues in their natural environment. Campàs decided to invent one. As a doctoral student, he had used oil droplets to measure forces exerted by a network of protein filaments that drive cell movement. Inspired by that work, he decided to try using oil microdroplets as force transducers in living tissues. Campàs and Ingber identified a special oil called a fluorocarbon that remains separate from the cell membrane, like oil does from water, and is safe for cells and tissues. Then they devised a special coating for the droplets so it sticks to cells or to the extracellular matrix. This enabled them to measure how cells push and pull within living tissues. The harder a cell pushes or pulls on the surface of the droplet, the more the droplet will be deformed. 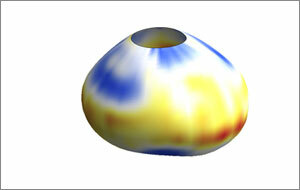 Therefore, the shape of the droplet reveals the pressure exerted by the adjacent cell. Credit: Otger Campàs/ Nature Methods. They also coated droplets with a chemical that made their surface glow when illuminated with a laser, then videotaped under a microscope as cells tugged and pressed on the droplet in 3D. The oil droplets on their own are spherical, but squeezing or stretching them deforms them as if squeezing or stretching a water balloon. By measuring how deformed each droplet was, the scientists could precisely calculate the force exerted on it by neighboring cells adhering to it and by the extracellular matrix. Using the new method, the scientists were able to quantitate the forces within lab-grown 3D aggregates of mouse mammary tumor cells, and within living 3D tissues from embryonic mouse jaws. They found that an individual cell exerted huge forces — 24 times as much pressure on the droplet as the jaws of an ant — and that the cells exerted the same amount of force in cultured aggregates as in tissues, lending confidence to the method’s accuracy. In his new lab at UCSB, Campàs now uses the method to determine the spatial patterns of forces that shape different embryonic structures in fish, chicken, and other organisms. In addition to Campàs and Ingber, the research team also included L. Mahadevan, Wyss Core Faculty member, Lola England de Valpine Professor of Applied Mathematics, of Organismic and Evolutionary Biology, and of Physics; David A. Weitz, Ph.D., Wyss Associate Faculty member and Mallinckrodt Professor of Physics and Applied Physics at Harvard SEAS; Richard Maas, M.D., Ph.D., a Professor of Medicine at Harvard Medical School and Brigham and Women’s Hospital; Tadanori Mammoto, Ph.D., Instructor at Harvard Medical school and Boston Children’s Hospital; Sean Hasso, Ph.D., a former postdoc at Boston Children’s Hospital; Ralph A. Sperling, Ph.D., a former postdoc at Harvard SEAS; Daniel O’Connell, Ph.D. ’11, and Ashley Bischof, Ph.D. ’13, former graduate students at Harvard Medical School. The work was funded by the National Institutes of Health, SysCode Consortium, the MacArthur Foundation, the Harvard NSF-MRSEC, and the Wyss Institute. The Wyss Institute for Biologically Inspired Engineering at Harvard University (http://wyss.harvard.edu) uses Nature’s design principles to develop bioinspired materials and devices that will transform medicine and create a more sustainable world. Working as an alliance among Harvard’s Schools of Medicine, Engineering, and Arts & Sciences, and in partnership with Beth Israel Deaconess Medical Center, Brigham and Women’s Hospital, Boston Children’s Hospital, Dana Farber Cancer Institute, Massachusetts General Hospital, the University of Massachusetts Medical School, Spaulding Rehabilitation Hospital, Boston University, Tufts University, and Charité – Universitätsmedizin Berlin, the Institute crosses disciplinary and institutional barriers to engage in high-risk research that leads to transformative technological breakthroughs. By emulating Nature’s principles for self-organizing and self-regulating, Wyss researchers are developing innovative new engineering solutions for healthcare, energy, architecture, robotics, and manufacturing. These technologies are translated into commercial products and therapies through collaborations with clinical investigators, corporate alliances, and new start-ups.